Number one — Only 60 cases of this cider were made, back in 2013. There’s not much of it left on shelves, and for what’s left you’ll pay a pretty penny. Number two — It pours a cloudy amber and the aroma that wafts up from it is green and medicinal. Keep chilled, but let it warm up a little from the refrigerator to unfurl its flavors. Number three — It’s dry, with a sharpness and bitterness from the hemlock & spruce needles used in its making. There’s both a woody aspect to the flavor and a hint of evergreen, sharp and biting, and the medicinal smell carries through to the flavor as well. There’s maple syrup in it, supposedly, but I can’t pick it out. I don’t doubt this could be paired well with specific meals, but it could also turn out to be a truly unfortunate accompaniment for others. It’s distinctive, and the profile would be jarring combined with a meal that had, for example, too many sweet notes. Of course I picked up this cider because of the recent popularity of the musical Hamilton. I saw it on the shelf and had to try it. It wasn’t until I looked up the Aaron Burr Cidery for this review that I found out it actually puts out a variety of small batches of cider and perry every year. A lot of them look interesting, so I’m hoping Schilling Cider House, where I picked up this bottle, will get stock from them regularly. I encourage you to pick up cider from the Aaron Burr Cidery if you come across it — I hope you’ll be satisfied. Posted in Cider. 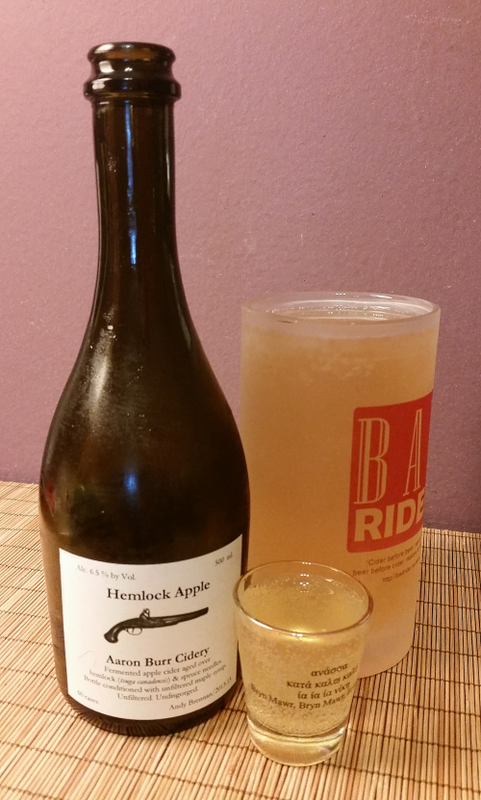 Tagged 500mL, aaron burr cidery, hemlock apple, limited release.